In addition to the free $15 for Chase Sapphire cardholders, there are several other Visa Checkout deals ongoing. Chase Ink cardholders can get $30 off $150 at Staples.com and Chase Slate cardholders can get $10 just for signing up for a Visa Checkout account. On top of that, there are also offers from Shutterfly and PizzaHut.com. Read on for the details. 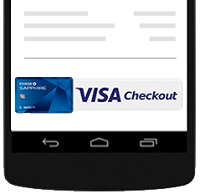 Through September 30, 2015, Chase Sapphire and Chase Sapphire Preferred Visa credit cardholders can receive a one-time $15 statement credit when they pay with Visa Checkout. Your purchase may be made at any store where you see the Visa Checkout button at checkout, which includes a long list of online merchants, such as Staples, Gap, Pizza Hut, Neiman Marcus, Newegg, Gymboree and many more. The terms also do not specify a minimum purchase amount, so presumably any purchase should qualify for the $15 credit. It’s been a while–over a year, in fact–but the up to 100,000 bonus Avios British Airways Visa Signature deal is back. As with previous versions of this offer, a significant amount of spending is required to earn those 100,000 Avios. Under this special promo, you’ll earn 50,000 bonus Avios after you spend $2,000 on purchases within your first 3 months of account opening, plus either another 25,000 bonus Avios when you spend $10,000 or 50,000 bonus Avios when you spend $20,000 within your first year. The annual fee of $95 is not waived. When you compare this promo to the currently publicly available offer of 50,000 Avios, which requires spending $2,000 within your first 3 months and does waive the annual fee, the difference is that in exchange for spending $20,000 more and paying $95 for the annual fee, you’re getting an additional 50,000 Avios. Through August 31, 2015, you can earn 80,000 bonus Marriott points when you spend $3,000 in the first 3 months of opening your Marriott Rewards Premier credit card. That’s significantly more than the 50,000 bonus points which is earned under the standard offer (after spending $1,000 in your first 3 months). Under the 80,000 bonus point offer, the annual fee of $85 is not waived. If you’ve been thinking about getting The Hyatt Credit Card, but have been waiting for a better deal, now is a good time to get one. While the standard signup offer promises 2 free nights at any Hyatt, and it has also been possible to get a deal for 2 free nights plus a $50 statement credit, there’s now a promo available which offers 2 free nights, a $50 statement credit as well as a possible 5,000 bonus points. As is standard for the card, you’ll need to spend $1,000 within the first 3 months to receive your 2 free nights. You’ll also earn a $50 statement will be earned after you make your first purchase. And with this new offer, in addition, you’ll also receive 5,000 bonus points when you add an authorized user and make a purchase within your first 3 months. In what has become an annual tradition, Chase has raised the signup bonuses on its Chase Ink Business cards during National Small Business Week. The Chase Ink Plus Business Card now has a signup bonus of 60,000 points after you spend $5,000 on purchases in the first 3 months of opening your account, compared to the 50,000 bonus points normally offered. 60,000 points is enough to redeem for $750 in credit towards travel through the Chase Ultimate Rewards portal. The Chase Ink Cash card is also offering an increased bonus of $300 cash back after you spend $3,000 in your first 3 months of opening your account, compared to the $250 cash back signup bonus that is normally offered. Both of these offers are due to expire on May 25, 2015. For a limited-time, through June 2, 2015, Chase and United are offering the opportunity to earn 50,000 bonus miles and a $50 statement credit when you sign up for a new United MileagePlus Explorer Card. Through this promo, you’ll earn 50,000 bonus miles after spending $3,000 within the first 3 months and a $50 statement credit after your first purchase. You’ll also earn another 5,000 bonus miles when you add an authorized user and make a purchase in the first three months. In addition, as a standard benefit of the card, you’ll earn 10,000 bonus miles each year when you spend at least $25,000 in net purchases. The popular +1 Movie Fridays promotion from Visa Signature and Fandango is back again this year. From April 24, 2015 through August 21, 2015, Visa Signature cardholders can purchase two or more tickets on a Friday for a Friday movie showing through Fandango, and get one of those tickets free — while supplies last. There is a limit of 1 complimentary movie ticket per Visa Signature card purchase, per 30 day period. Chase Visa Signature cardholders get a slightly more flexible redemption window–they can purchase their tickets on Wednesdays, Thursdays or Fridays for a Friday movie showing. Full terms of this offer can be found here. To take advantage of this promotion, visit this link. The popular 50,000 point promotion for the Southwest Airlines Rapid Rewards Premier card is here once again. When you spend at least $2,000 within the first 3 months of opening your account, you’ll earn 50,000 bonus points. 50,000 points doesn’t go quite as far as it used to, given the recent Southwest point devaluation, but it still can be worth over $700 towards Wanna Get Away fares.